Cavers that come to South Wales are to benefit from a new digital safety net, thanks to the efforts of local Openreach engineers. 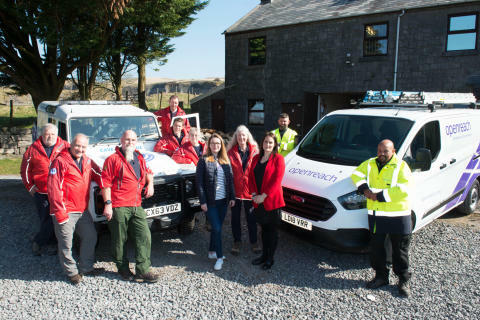 The South and Mid Wales Cave Rescue Team’s (SMWCRT) depot, in Penwyllt above the Swansea valley, is being fitted with a faster, more reliable and future proof broadband connection which will help further improve its search and rescue capabilities. With fibre now being connected directly from the local exchange to their depot, the rescue team will have access to some of the fastest internet speeds in the country and be able to utilise valuable online rescue software. The team expects the connection to enable all of its 180 members to be contacted simultaneously at the touch of a button when their rescue skills are needed next. The new ultrafast and reliable broadband connection will also mean the team can access vital real-time data, such as accurate localised weather forecasts, which could help save valuable time in a rescue operation, and potentially lives. The new connection has been made possible by building on top of the infrastructure that was developed by the Superfast Cymru programme which was jointly funded by Openreach, Welsh Government and UK Government. “When we are called out we have to mobilise the right resources, to the right location in a timely manner. “With an ultrafast broadband connection, which wasn’t available to us until now, our surface controllers can now be based at our depot in Penwyllt, and can be confident that the information they need is available in super fast speed”. With a potential drive time in excess of two hours to a rescue scene, the ability to track the whereabouts of volunteers in relation to an incident, in real time is seen as a key benefit of the new ultrafast broadband connection. Prior to ultrafast broadband being made available to the depot, the charity had to rely on more traditional telephone and paper-based systems to manage their callouts and rescue attempts. The South and Mid Wales Cave Rescue team recently gained international recognition for supporting the successful rescue of the Moo Pa young football team and their coach from a cave in Thailand. “Across South Wales there are caves that are up to 90km long so you can appreciate how time and communication is vital should you need to send a rescue team underground. Established in 1946, the South and Mid Wales Cave Rescue Team is one of the oldest rescue teams in the UK. Made up of 180 volunteers the charity responds to a wide range of incidents on behalf of three Police Forces and two Fire Brigades. It’s area of operation extends from Welshpool across to Aberystwyth and everything in Wales below that line – including Pembrokeshire and Monmouthshire. In addition to traditional cave rescues, the team were also involved in the high-profile search for April Jones and provide technical support to mountain rescue teams as well as assisting in animal rescues and road traffic incidents. Across Wales nearly 95 per cent of homes and businesses can access superfast broadband today. That’s better broadband coverage than France, Germany or Italy. With the largest rural fibre to the property footprint in the UK, Openreach has recruited nearly 450 engineers throughout Wales over the last 12 months to help maintain and further improve the network which includes the roll out of its ‘Fibre First’ programme in Swansea and Cardiff.